An Open Data Conference ‘Harnessing Open Data’ took place on 19 November 2018 in the Wood Quay Venue, Dublin 8. 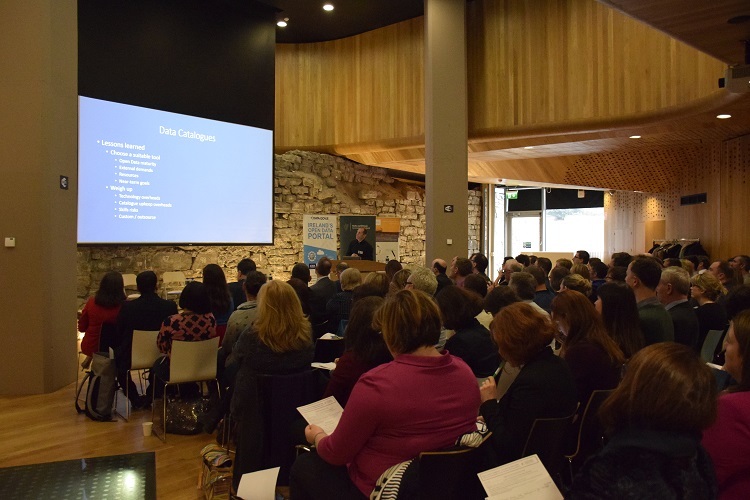 Over 130 public servants from a wide range of public bodies attended the conference which was organised by the Open Data Unit in the Department of Public Expenditure and Reform. It was chaired by Dr Dennis Jennings, Chair of the Open Data Governance Board in the morning and by Prof. Daithí Mac Síthigh in the afternoon. Keynote speakers included national and international experts on open data from the public and private sectors who gave a perspective from both the role of data publishers and of data re-users. There was also an opportunity to get an update on the recast of the Re-Use of Public Service Information (PSI) Directive, the text of which is currently being finalised. Speakers included Tim Willoughby, An Garda Síochána, Niamh McDonnell, National Archives, Michael Healy, Limerick City and County Council, Barry Lowry, Government CIO, Gianfranco Cecconi, European Data portal, Dara Keogh, Geo Directory, Brendan Cunningham, Pinpoint Alerts and we also heard some local examples of how data is being used in the Connemara Programme and in area planning in Cromane, Co Kerry as well as from the CSO on Linked Data. This ‘Harnessing Open Data’ Conference provided an important opportunity to share best practice in relation to open data publishing as well as seeing the benefits of open data from some very interesting examples of data reuse. We hope that this will be an annual event. Some of the presetnations given on the day are available below. Data initiatives in Limerick, what’s worked, what hasn’t, lessons learned: Michael Healy, Limerick City and County Council.